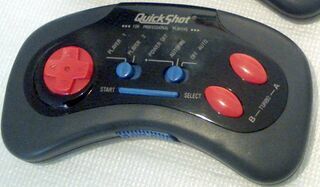 The Wireless Controller from QuickShot is, as the name suggests, a wireless third-party controller. It was built for the Sega Master System, and is very similar to the Starfighter 3W in design. The package bundled two controllers with a receiver, and also has extra leads for the NES. The official name of this peripheral is not currently known, however its code name is QS-127. In Brazil it was licensed by Tectoy as an official product.